A 43 year old man who killed his wife and then claimed he had been the victim of a “frenzied attack” has been jailed for her murder. Stephen Barnsdale-Quean denied murdering Chantelle Barnsdale-Quean at their home in Upperwood Road, Darfield, on 4 March this year. Instead, Barnsdale-Quean told police his 36 year old wife had attacked him, leaving him unconscious and so he had no knowledge of her death. 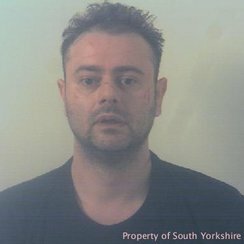 However, following a two-week trial at Sheffield Crown Court, he was found guilty and handed a life sentence, to serve a minimum of 18 years. Barnsdale-Quean called for an ambulance saying he’d been injured. When paramedics arrived, they found him unconscious in the hallway and the body of his wife in the bedroom. A post-mortem examination found she died of strangulation. Barnsdale-Quean had two stab wounds to his stomach, which he claimed were caused when his wife attacked him. The court heard how officers found no visible signs of a disturbance and how the injuries he sustained could have been self-inflicted. Susan Benson, Chantelle’s mum, released a statement on behalf of the family. She said: “My loving daughter Chantelle was cruelly taken away from our family and my grandchildren will now not have their mother with them at important times in their lives. “The whole family feel a terrible void without Chantelle in their lives.